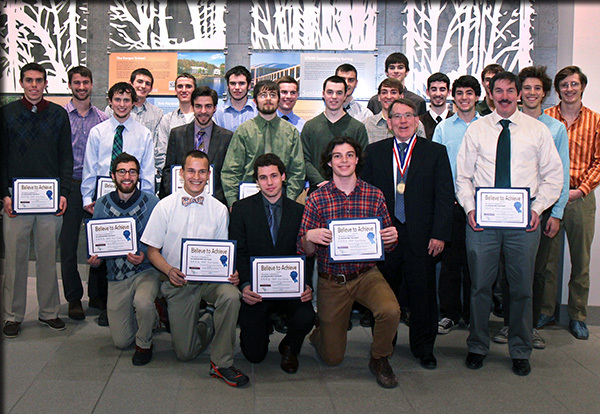 The Mighty Oaks men's cross-country team from the SUNY College of Environmental Science and Forestry received a 2013 Believe to Achieve Award for capturing its third USCAA national championship. The award presented Jan. 15 by the Syracuse Sports Corp. recognizes the team's accomplishment of winning three consecutive national championships. The Syracuse Sports Corp is a local sports commission that works with the Syracuse Convention and Visitors Bureau in planning, managing, organizing and staging a variety of sporting events. The organization recognizes superior athletic talent and noteworthy achievements among local athletes with its Believe to Achieve Award.